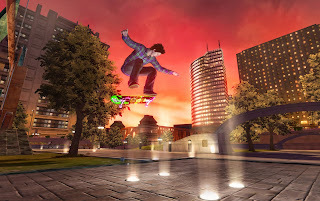 So what gives - most of the industry (and gaming community) as a whole is giving the latest Tony Hawk game a lot of flack for being pretty much a waste, and we here at Mashbuttons, want to give you our take on the latest game-turned-peripheral business from Activision. What we have here is an example great idea, in theory, but in execution, it just doesn't work. You get a fairly true-to-life size plastic skateboard with some revolutionary tech built-in. There are 4 sensors, one on each side, and one at the nose and tail that sense feet placement, movement and grabs. You start the game with about a 10 minute calibration, then it's best recommended that you jump into the training here. It should be noted that there are three levels of difficulty. The first has you completely on rails. You can't really go where you want, your sole purpose is to just perform tricks with the board. This is the dumbed-down version meant to cater to the casual audience. Next, you can increase the difficulty, allowing freedom of movement, but with a "steering and trick assist" enabled. Lastly, you can go all out and control your navigation, tricks and everything. This is in case you have the dexterity and skill to ride a real skateboard, but don't. There are more game modes at play here, party modes that you can play locally or online on Xbox Live (or PSN), but they do little in the way of adding much enjoyment to this title. Tony, we have an idea. You should work with the makers of Tech Deck - the finger skateboards, and that can be the next controller. You can finger-skate all over your own little skate park, and the action is translated to insane effect on-screen. It'd be like an Augmented Reality Game - and frankly, you'd probably get a little more buy-in. If I wanted to spend $120 wisely, I'd buy another real skateboard and hit the curbs out in my neighborhood instead of falling in my living room. Mashbuttons gives Tony Hawk: RIDE a 5 out of 10.